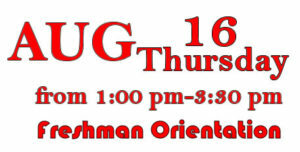 Freshman Orientation will be held on August 16, 2018. The Student (ONLY) Session will be from 1pm-3:30 pm with the Parent Session from 4-5:30 pm. Only students are allowed during the student session to allow them to get to know each other and ask questions freely. Students should bring a drink, small notebook and something to write with. Be ready to have some fun & meet new people! All School Orientation will be on August 10, 2018. Everyone is encouraged to attend. Times are by grade level so 9th graders should attended between 9am-11:30am. Please sign up to attend Freshman Orientation while at the School Orientation or RSVP through the Front Office at 281-741-8899.